Subtitle: "An Epidemic of Misdiagnoses." In this revised, expanded and updated second edition, Could It Be B12? An Epidemic of Misdiagnoses uncovers a public health crisis that even many doctors don’t know exists—the chronic misdiagnosis of vitamin B12 deficiency. 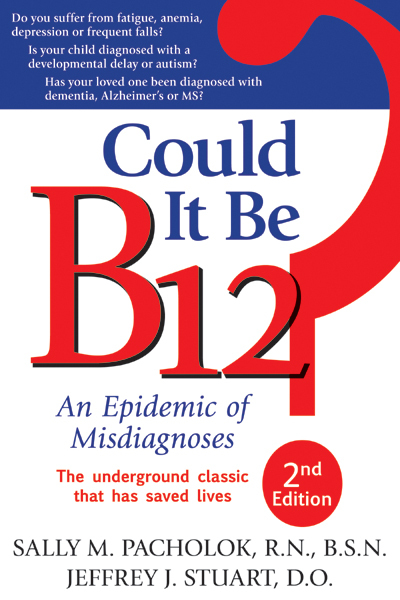 Written in a highly accessible style that makes complex medical information clear and comprehensible to ordinary patients and their families, Could It Be B12? gives readers the knowledge and confidence to fight the ignorance and rigidity of the medical establishment and take control of their own health. Could It Be B12? presents vital information and strategies for readers to learn if they or their loved ones are suffering from B12 deficiency and how to work with their doctors and other health care professionals to get the treatment they need. An Indie Excellence Book Award Winner. Few patients are tested for B12 deficiency, even though it’s a common disorder that can be easily diagnosed and inexpensively treated. The manifold symptoms of B12 deficiency can look exactly like a myriad of different diseases, misleading doctors to misdiagnosis. B12 deficiency can dementia, multiple sclerosis, early Parkinson’s disease, diabetic neuropathy or chronic fatigue syndrome. It can cause depression and mental illness, infertility in men and women, or developmental disabilities in children. Could It Be B12? also presents a stirring message against the medical profession’s indifference to the epidemic levels of crippling B12 deficiency and a demand for worldwide social action to raise awareness and win the fight against this easily prevented disorder that so needlessly ruins millions of lives. About the Authors: Sally M. Pacholok, R.N., B.S.N., an emergency room nurse with 24 years of experience, received her bachelor’s degree in nursing from Wayne State University. In 1985, Pacholok diagnosed herself with vitamin B12 deficiency, after her doctors had failed to identify her condition. Jeffrey J. Stuart, D.O., a board-certified emergency medicine physician who has practiced for 18 years, received his Doctor of Osteopathy degree from the Chicago College of Osteopathic Medicine. COULD IT BE B12? MEDIA KIT available here in PDF.